What is RF ? It stands for Radio Frequency ? Then what is the Radio Frequency. Simple Definition from Wikipedia says as follows. Just in terms of concept, it may seem pretty simple, because most of RF system is made up of very similar conceptual blocks as shown below. The ideal operation of each components are very simple as described below. iii) Mixer - Changes a certain frequency into another frequency by multiplying two input signals. 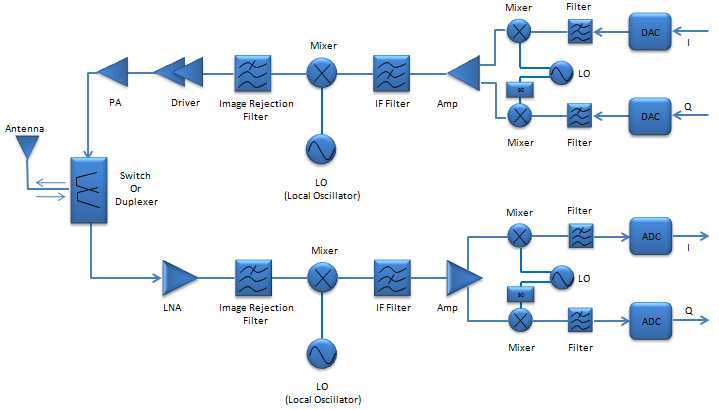 vi) Filter - Remove undesired signals from an incoming composite signal. i) There is no RF components in the market which meets the ideal requirement 100 %. You would need both theoretical basis and artistic skills to implement RF components which is close to the ideal requirement. ii) Even though you have complete understandings on a component which works in almost ideal way at certain frequency and a certain input power, it would not guarantee to work at a different frequency and different power level. As any other form of art, it may take whole of your life to make it mature and satisfactory and it can never be achieved only by logics and theories. It would need a lot of creativity and never ending repetition of do-redo process. My pages on RF would start with very beginner's level mostly for those who just started in this area and most of the contents will start with big pictures and overall concepts. It will take at least one or two years to improve these to the level which would help those who is working in this area as a serious engineer. Before I go into the details of each RF components and subjects, let's briefly review the typical RF system and evolution of the system. The three illustrations shown here is showing 'Reciever' path, but 'Transmitter' path is also very similar if you just replace 'LNA' part with PA (Power Amplifier) and change the direction of arrows. Type 2 : Homodyne (Direct Conversion). Second type of the architecture is the one without IF section. It means that the signal get converted directly from RF to baseband and baseband to RF. That's why it is called 'Direct Conversion'. There used to be technical issues (e.g, DC offset or noise removal) and it is hard to do direct conversion when the RF frequency is very high. But the benefit for this system would be obvious. Less component, less cost and probably/hopefully less trouble for tuning components. Now technology has been improved and mature enough to make practical use of this architecture in some area. As far as I know, most of the mobile phone we see in the market now (2013 as of now) would use this kind of architecture. If you are interested in further details DigRF, refer to following links. The illustrations shown above shows only a single direction (reciever path) to make it simpler, but most communication system has both reciever path and transmitter path as shown below. You would notice that overall picture is very similar between reciever path and transmitter path. This would be good enough for high level understanding, but if you are the RF engineer working on this you would know a lot of subtle differences among the components being used for reciever path and transmitter path.